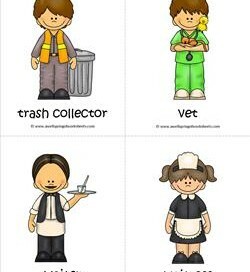 The adorable characters on these community helpers flash cards will get your kids talking about the workers and their occupations in their neighborhood! Use in a social studies lesson, for kids to review during play time, or post them in a pocket chart. Print them out and cut along the dotted lines. They’ll hold up longer if you print them on card stock and laminate them. Just the right size for little kids hands! Please go to this page to choose from all our community helpers resources. 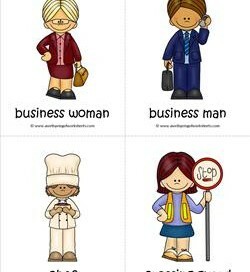 On these flashcards you’ll find these workers at the beginning of the alphabet – a businessman and woman, a chef, and a crossing guard. 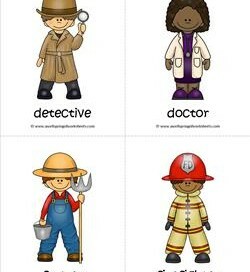 This page of community helpers flashcards includes a detective, a doctor, a farmer, and a firefighter? Which one do you see most in your city? 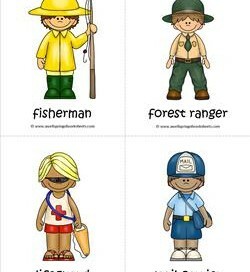 We go from the forest to the water with these community helpers flashcards: a fisherman, a forest ranger, a lifeguard, and a mail carrier. The four community workers on these flashcards sure are from different walks of life! 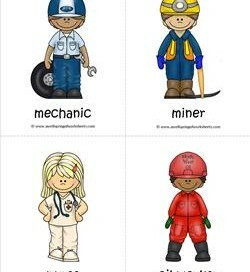 There are a mechanic, a miner, a nurse, and an oil worker. 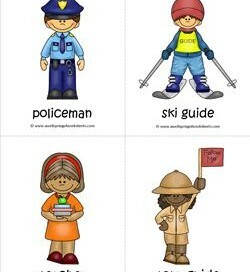 On this fifth page of flashcards you will find the all-important policeman and teacher, and the occasionally encountered tour guide and ski guide. Get your wallet out! You will definitely need to pay a bill to these helpers: a trash collector, a vet, a waiter, and a waitress. Don’t forget the tip!